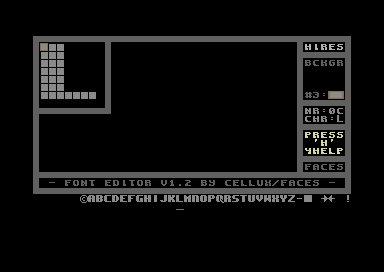 Have you ever written a good SEUCK game, and you get fed up with the same old front end, with the rolling raster bars?. Or do you want to make more of a better presentation for a SEUCK game? You can, but before you can actually do that you may need to learn 6502 assembly to adapt better features to your presentations. This tutorial will show you the basics of writing a simple front end for your own SEUCK game, which will feature a bitmap logo, a 1 screen presentation and scroll text and of course playing music in the background. This example will work on BOTH standard and the SIDEWAYS SEUCK mod. 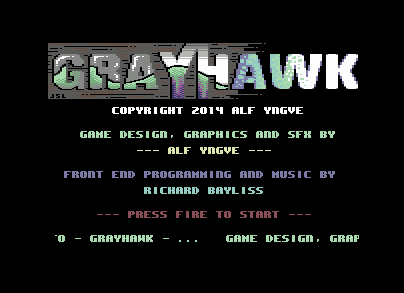 In this example, I'm going to use one of the existing games called "Grayhawk" by Alf Yngve. We have also supplied some PD tools for you as well as the example source code on this disk. If you would like to try it out. Click on the Disk icon to download it. Warning: You will require the TASM/Codenet cartridge plugin or 1541Ultimate II with TASM/Codenet set up. Or use of a Cross platform Assembler/Compiler that supports Binary files. Or, how about the ACME cross assembler PRG binaries and source? Here you go. Before you get started, you will need the following resources set up for the project. I shall also give you tips on various parts in the tutorial. Your character set can be extracted from your SEUCK, using the M/C monitor on any freezer cartridge (or VICE monitor). The SEUCK game front end charset lies from $f400-$f800. You can then load in any Public Domain char editors to update the characters, put them in place etc. And save them again. Or alternatively, if you really wanted to. Build your own character set and save it. A bitmap logo can be saved in different formats, but the common method I use is to convert an existing bitmap picture into VIDCOM paint format, and then strip out the picture data file separately. - Load in a painting program or picture viewer that supports the format of your picture (E.G. Amica Paint and Interpaint supports Koala Paint format). - Display the picture and then press the FREEZE button (ALT+Z if using VICE). Enter the Picture Save option in the menu and save as VIDCOM paint format. Enter the filename. The Vidcom paint picture data will load from $5800-$7f40. We will need to strip the data out. Since the logo should be at leat 8 or 9 char rows. We can strip out a small area of the bitmap data. We want to design / edit our own front end screen text with colour built in memory. There are different ways in which this could be done, either find an existing colour+screen editor, or program a small simple screen+colour editor for personal use. For this one, we are going to build a little tool called KRAPSCREEN using the TASM/CodeNET Turbo Assembler utility. - Type in TASS - This will take you to the Turbo Assembler. - Now enter the following listing. - After the program has assembled to disk. Press the RESET button on the cartridge (ALT+R in VICE). Enter the fastload prompt and load in KRAPSCREEN. - Type new. Enter SYS 2304 to run Krapscreen. Now edit your own front end screen and colour text. Pressing RETURN will exit KRAPSCREEN with a READY PROMPT. - We shall now save the new front end on screen text. It is already stored in memory where we want it to be located ($7c00-$83e8). Now let's save the front end text screen and colour data to disk. Okay, job is done. Now for the next task. The next step is to pick some music. You could always browse through the HVSC for any tunes that Init $1000 and Play $1003 and is not bigger than $1000 bytes. The bad news is that you will need to relocate your music to $9000. There are different possible ways. However, to play it safe, you can use my tunes from my DMC collection and make use with the All Round Relocator, which can relocate music composed with JCH Newplayer or DMC V2.0 - DMC V5.1. I included the relocator with the first two DMC Collections, which available to download from the C64 Music section on my web site. - Relocator should find PLAYER: DMC V4.0, now enter $9000 as the address where music should relocate to. Load in your SEUCK game, which you want to build a new front end for. Then run it (Unless your game was saved as FINISHED game, instead of compressed or frozen). Have a little play around with the game, if you want. Otherwise go into the FREEZE option and enter the M/C monitor. We want to do some spring cleaning by filling wasted memory between $6580 - $b6c0 with zero bytes ($00). Ok, that was cleaned pretty successful. - Ok, nearly done. Just one more thing to add. Assuming that you have got all the data you need and you had enough, playing the game. It is time to program the new front end using the Turbo Assembler, in TASM/CodeNET. Where you are still at the game, press the RESET button (ALT+R in VICE), then enter TASM/CODENET. Here is the full listing for you to type into the assembler. I have also included some explanations about what happens in the code. This is a possible way to build a new front front end and link it to a SEUCK game. ;font (Otherwise just comment it out). sta $01 ;usage of Hi-Mem. ;that were used in the game. ;and drawing each row by 40 columns. ;stored to the screen area which we use. ;do this. They need to be initialised. lsr a ;two fire button. lsr a ;code repeat itself. cpx #40 ;40 chars read? sta $dd00 ;for text chars. sta $d018 ;screen at $7C00. ;Interrupt 2 - Displaying the logo. 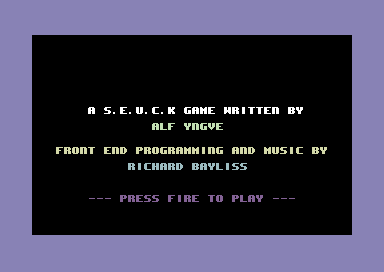 .text " ... welcome to - gr"
.text "ayhawk - ... game de"
.text "sign, graphics and sou"
.text "nd effects were done b"
.text "y alf yngve using the "
.text "shoot 'em up construct"
.text "ion kit by sensible so"
.text "ftware ... front end"
.text " programming was done "
.text "by richard bayliss ..."
.text " bitmap logo was dra"
.text "wn by johan janssen .."
.text ". music was composed"
.text " by richard bayliss .."
.text ". copyright (c)2014 "
.text "the new dimension ... "
.text " mission briefing: i"
.text "t has come to attentio"
.text "n that deep in space, "
.text "an alien threat awaken"
.text "s ... aliens are sto"
.text "ring substances on hug"
.text "e asteroids ... thes"
.text "e could result to deva"
.text "should they be used to"
.text " build deadly weapons "
.text "... you must pilot a"
.text " greyhawk fighter ship"
.text " across all of the ast"
.text "eroids, and destroy ea"
.text "ch one (after you have"
.text " passed over it) ... "
.text " the asteroids are hea"
.text "vily guarded by the al"
.text "iens, which you must a"
.text "lso blast ... can yo"
.text "u destroy all of the a"
.text "steroids and whatever "
.text "is left on them, or wi"
.text "ll the galaxy be doome"
.text "d forever? ... there"
.text " is only one way to fi"
.text "nd out ... press fir"
.text "e to start the game .."
Note ... If you want to load the example game and the listing that is already on the tutorial example disk, you must load in the RAW SEUCK game file (Which was saved using the SAVE AS FINISHED GAME option). Do the 3 steps before (The F 6580 B6C0, tips, etc). Press the RESET button and select the fastload option. Load in the TITLEDATA then enter the turbo assembler. Load the sequential version of the listing using BACK ARROW + E and type in FRONTEND.SRC*. The listing will then load in. Now type the 2 lines (indicated in yellow above the previous paragraph). Assemble and run. A READY. prompt should appear. This will save the whole game to disk from $0810 (Where we added the SEUCK title skip init routine) all the way to $FFFA. The file size will be 249 blocks. Type in G 0810 to run the game. Voila. A new front end linked to your SEUCK game. Is this the end of it? Not quite. It is time to make the file size shorter. What do we do? ... Crunch it. - Wait for the file load and pack. If you load in the compressed game game (before using a cruncher) you'll need to type in SYS2049 to run it to see if it works. If it does, then the next stage just for you. - Crunching step = speed (1 is fastest crunch speed), the higher the step, the better result, but slower ther crunch gets). - Select RUN program option. The screen should blank and then come on and execute the Zipper decruncher which will then run the game. That's it, job is done. If the packing/crunching method takes too long for you, then we recommend usage of PuCruncher or Exomizer. Exomizer gives out the best results, but the decruncher takes longer, where is PuCrunch crunches as hard as possible and gives a shorter decrunch.